MuseX is an app that utilizes the user’s voice as an instrument to create layered musical tracks. Although everyone listens to music, few know how to construct a song. Some people think you have to master a musical instrument – like the piano – or learn complicated software to be able to create music. With new technology at our fingertips, it’s time to democratize the music making process. With MuseX, making music is no longer limited to composers or musicians. MuseX works by breaking down songs into layered tracks, which the user can edit or add to by merely humming along. Users record their voice, then convert the track to a selected musical instrument. Multiple tracks are layered together to form a song. The user may start from scratch or choose from a wide range of ready-made songs, which they can freely edit. MuseX provides an end-to-end experience – from listening to a favorite track to creating your masterpiece – and brings the joy of music making into the hands of people everywhere. I tried to find a solution - is there a more natural way to create music? To learn more about the current field of music creation, I did some research on existing products and applications that were made for people like me. I found that people like playing music games like Guitar Hero or Patatap. However, these games don’t help users learn how to create music - instead, they only provide fun and entertainment. Other than this, the music production software that I researched, such as Digital Audio Workstation, was not easy to use. The users that my app targets are beginners in music, neither musicians nor composers but amateurs in creating songs. I began by interviewing my friends. Many of them had similar views on music - they liked listening to songs, but had difficulty making or creating melodies. They would try, but then give up because they didn’t know much about music theory. Even though a few could play instruments, they were by no means professionals, and their skills were not high enough to create brand new songs. Since the learning process is laborious, they gave up quickly as they had no sense of achievement. One central aspect that my target users have in common is that they listen to music all the time. They may feel passion and inspiration when listening, and perhaps wish to make a similar or different song. My target users do not belong to the professional musician sphere, and along with this, using music making software can be complicated for them. If it takes too long to figure out, they may give up soon. For beginners and amateurs in music, creating music is difficult due to lack of musical inspiration, low knowledge of instruments, and complicated software that can be frustrating to use and learn. Because of these limitations, beginners end up losing enthusiasm and interest. Everyone has the right to be creative! I believe that making our own music should not be limited by lack of easy access. I hope to guide my target users to make the first step towards musical creativity, and to give them easier access to music making! I used to read many articles that talked about helping people make music, and this research taught me that one way to learn how to write melodies is to analyze and deconstruct existing melodies. A great way to do this is to analyze midi files - midi files are a modern-day version of sheet music. They are digital, editable files that may contain anything from simple melodies to fully completed songs. At the same time, I started thinking of other artistic experiences such as drawing. If you wish to draw a picture, but don’t know how, the easiest way to begin is to use an existing picture and trace. After drawing the same picture or adding personalized changes, eventually, you learn how to draw on your own. This led me to think more about the human voice as an instrument, and I began conducting technology research on the topic. I found singing apps that were able to sense if users were hitting the right notes. This gave me an idea - can I use similar technology to include the human voice into the music making process? I hoped to find the right technology that could convert voice notes to midi files, in turn creating an opportunity for editing, organizing and introducing different musical instruments in place of voice notes. I found similar products in the market, which I have included in the Competitor Chart at the right. 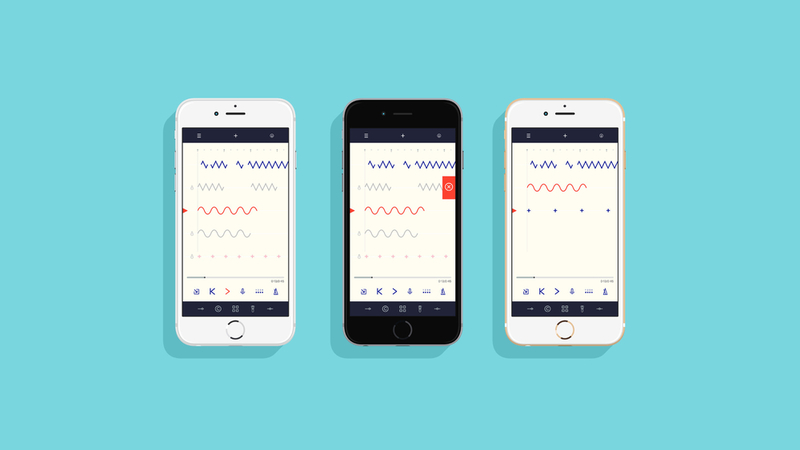 MuseX is an app that uses our voice as an instrument to create layered musical tracks. It aims to be an integrated and immersive experience which combines music-listening and music-making. Users can record their own voice and convert it to different sounds of musical instruments. After testing the initial wireframe, shown above, I decided to create user tests, in which my classmates would test the prototype and provide feedback. After conducting user tests, I received mixed feedback: many liked the design, but were slightly confused on different elements of the app. The constructive criticism that I received aided me in designing my final app design, shown below. When I was brainstorming for ideas, my friend Jess gave me a great recommendation: MuseX. I loved this suggestion because MuseX sounded similar to “music,” and “muse” means the source of inspiration, which was perfect because the app finds the human voice as inspiration for new songs. The name also fits well because the app provides many resources to inspire and help you to create new melodies.